Last year I finally pooled the trigger and purchased the dinghy we always wanted. The list of primary candidates was Zodiac, Caribe, Amanzi and AB. I happened to find a great deal on AB DLX 11 with 40HP Yamaha motor and for number of reasons we made the decision that this is the one for us. So, the season of 2013 starts and starting to enjoy new toy. Everything goes great until few months in the season I’ve started noticing discoloration of SS parts. I figured that I’ll just keep an eye on it and will maintain my regular routine. The dinghy is used for the weekend and gets rinsed with fresh water and is covered 90% of the time as soon as it gets back on the lift or when we’re back at the dock when I wash it along with the big boat. Another month or so goes by and the issue is only progressing where I see that SS parts are now shifting from discoloration to rusting stage. I don’t wait much longer and contact AB official rep for the Northeast region. It takes me a while for him to start responding as AB has no interest in assisting me with this. As more time goes by I’m finding out that my boat is not the only one with this issue. So, I take detailed pictures and try to build my case for another attempt for AB to take the responsibility. I try to explain that there’s always a chance for a defective (or poor quality) SS batch of parts being installed and as long as AB can send me the replacement I’ll handle the installation. To make long story short, the extended emails and phone calls lead me to the final word I’ve received from AB. They refused to acknowledge this as their responsibility and insist that this is nothing more than a maintenance item. As you can see from the pix, it's not just nuts and bolts, it's all SS hardware that's developing rust, even the steering wheel. 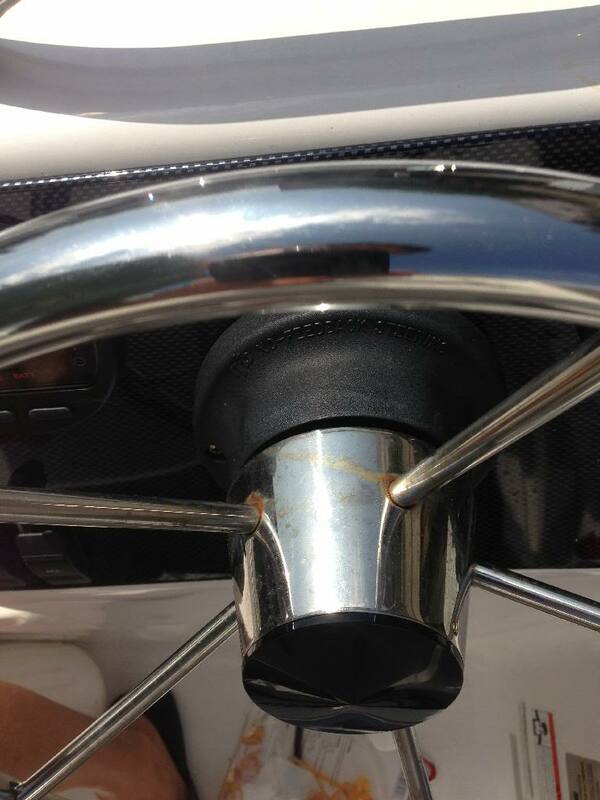 - AB is using poor quality SS parts and it turns in to maintenance nightmare when the boat is only few months old. 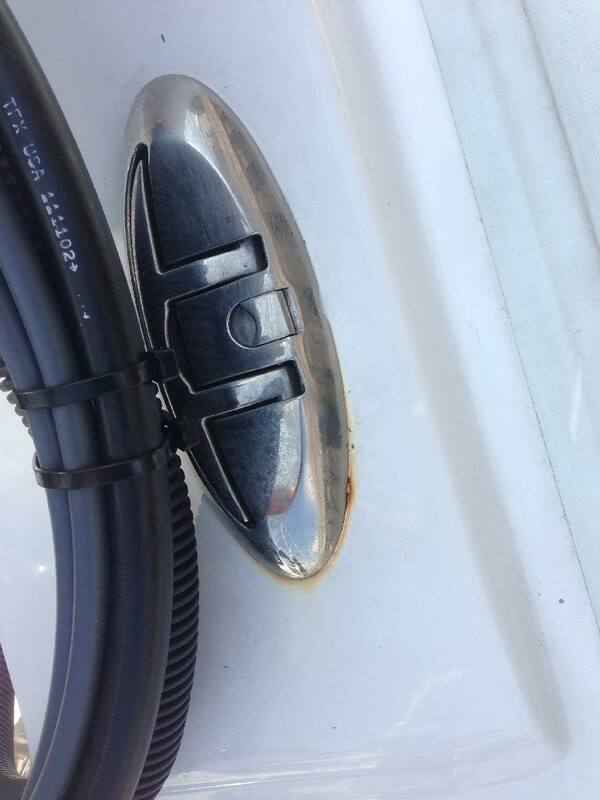 - AB warranty is worthless since they refuse to handle an obvious issue on a practically brand new boat. The purpose of the thread is to warn my fellow boaters who’s looking to spend their money on this tender is to be aware of the SS parts rusting issue and if you decide investing in AB, be prepared to deal with this on your own. If we have some members that are willing to step in and share the same problem, we probably have much better chance getting AB to take any kind of responsibility if we work as a team having much bigger voice vs. doing it individually. Those that wish to keep this “quite” we can still do it as a group while communicating via PMs or emails. Certainly something they should be addressing. I did decide to look at their warranty on 2013's and newer out of curiosity. They do mention "hardware" under accessories and say it's warranty is one year. Then they add a clause saying, "This warranty does not include any painted or ﬁnished surfaces." I wonder if they consider Stainless Steel a finished surface. Funny in many places where they talk about their 10 year limited warranty. See dealer. wear and tear. Valves and seams are 5 years with exclusions allowing them to say you under-inflated etc. Fiberglass and aluminum 2 years but doesn't include surface finish. Accessories 1 year. The reality is warranty's are written by lawyers and often give lots of outs. Some sellers use those out clauses. Others go beyond the written word, especially with a known or common problem. I decided out of curiosity also to look at the warranty of a brand we own. Tubes only 3 years, fiberglass 3, but all components 2 years. I would be interested in other's experiences with warranty claims on RIB's. I guess I never really anticipated much unless a severe and obvious issue with the tubes. Just bought an ultralight 9. Raw aluminum hull, so no stainless parts to go bad on this one. I have discovered that the local dealer is the key to any help on dinghy's. We have one here in Seattle that is a joke. Then just 3 blocks down is a superior dealer that will take care of you. Both carry multiple major brands. The puzzle is how the inferior dealer is still with us? You might see if there is a different local dealer who will treat you better. I think often dinghy's are sold more as sporting goods items than boats, at least in approach. They figure you buy it, you own it, take it and that's the last we'll see of you. Dealers have turned over as have manufacturers. The representation changes month by month it seems. They seem to have a difficult time maintaining dealers even in the Fort Lauderdale area, so I can only imagine the rest of the country. I couldn't find the option how to edit my original post. The only option I saw was reply, this is the only way I could add the pix. Thanks for your reply. Since I had direct contact with the official AB rep for the entire Northeast coast I thought that I'm dealing with the "right contact". When I had questions about something my dealer didn't have answers for he would go to the same guy, the dealer was the one to give me this contact info in the first place. But, maybe you're right and I should give a shot and contact the dealer I've purchased the dinghy from. During the season I did talk to another dealer who said that it's best to contact AB directly and they stand behind their product so they'll take care of me. Oh well, obviously it didn't happen. 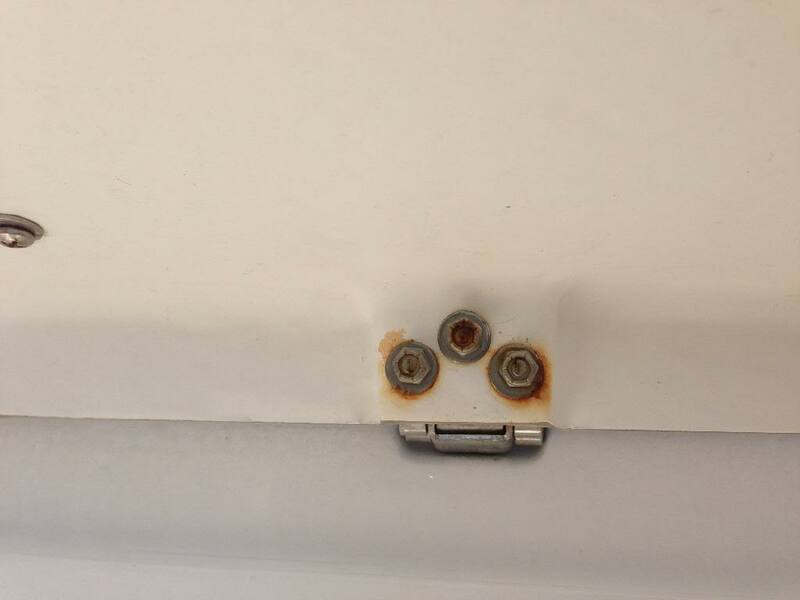 I hope that not all stainless out there does this...but many of the parts including my recently installed swim step ladder looked like that in months after install. It doesn't get worse...but does look like your pics. I would replace that crap asap. My stainless doesn't do that, None of it. Either of my boats. It's a lot easier to clean it now than wait. Take it all off/wax the boat/install the new and put that crap in a bag and then bash em'. No time to lose. It looks like your hardware is not bedded at all. 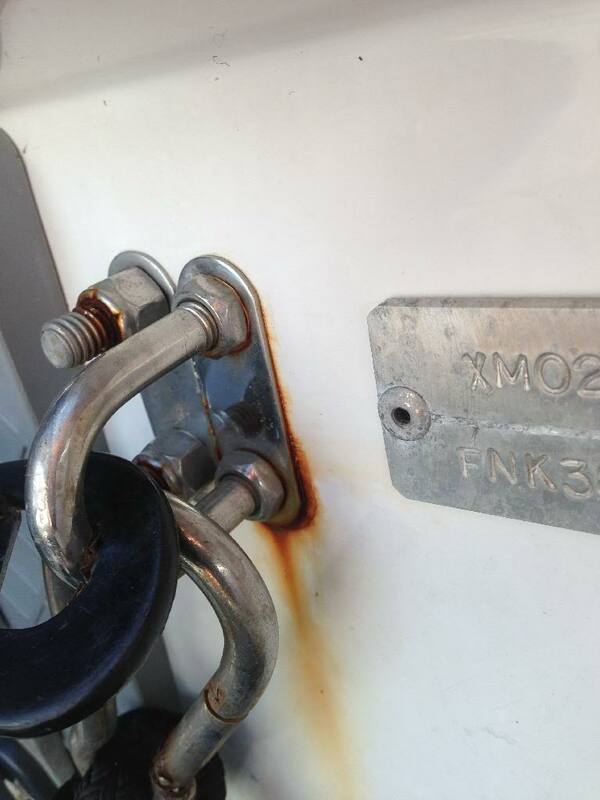 Water is sitting stagnent between the fastener and the fiberglass and causing corrosion. Very common. Remove the hardware, bed it with LifeCaulk sealant and re-assemble. Wont work for the SS wheel spokes though. These are from our Achilles RIB. About 2 x year I get the toothbrush out, some oxalic acid and then some polish. I guess I better get at it. I'm not sure that to be fair to AB should apply in this case for number of reasons. I'm getting feedback from other AB owners that have 4-5 yrs dinghies with ZERO rust on the SS. I have friends with other brands who also have no rust issues at all. 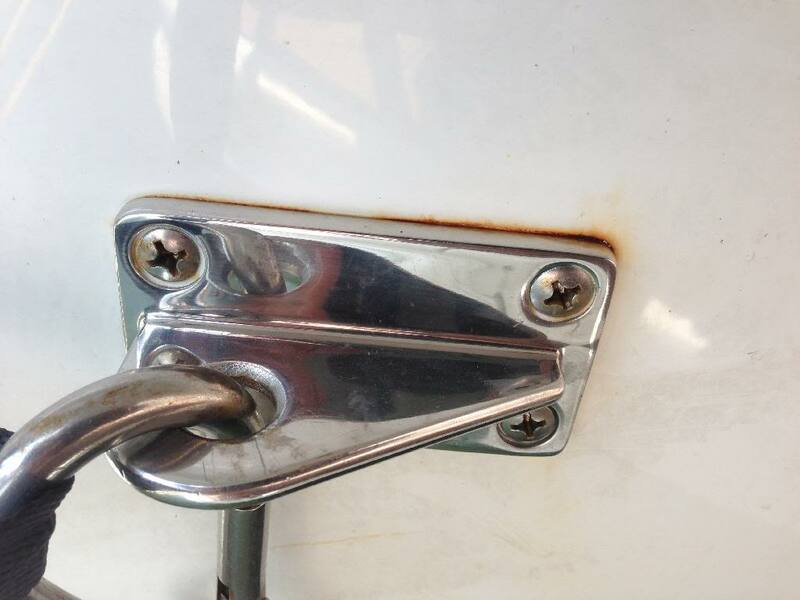 I've owned sever used boats (I'm referring to big boats, not dinghies) ranging from 4-10yrs old and none had this issue. I would agree that some occasional stain on a boat that's fully exposed to the elements would be normal maintenance item on a used boat. But we're talking about brand new boat here that has been always washed and covered. The SS parts don't have stains anymore, those stains are now a true rust. I think the approach "to be fair..." should actually be applied to the customer (me) in this case. I have no idea how AB plans to maintain loyal customer base by telling people "get lost" when there's an issue that clearly demands their attention. I have to side with Alex on this. I would be real upset if that was my boat. 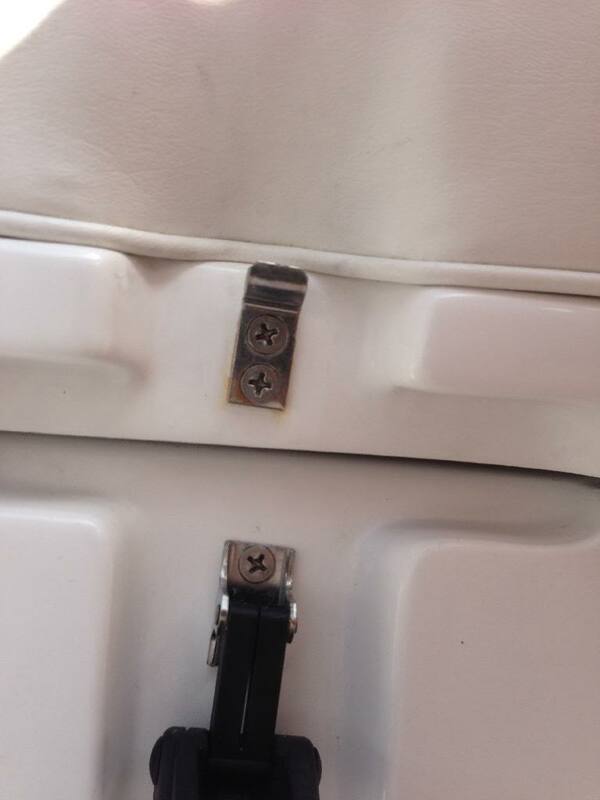 They probably saved $30 on a $3500 dinghy by using substandard fittings. As I am currently looking at dinghy's, this will certainly influence my decision. Replacing the SS parts is what exactly what I'm planning to do. The puzzle is where do I get these parts in higher grade SS, so I don't have the same issue after few months down the road? I agree that lack of bedding and low grade SS parts are the main two contributors. If my attempts to go through my or other AB dealer would leave me with the same results, then I'll address this on my own. Do you think that LifeCaulk sealant is better than 4000UV? 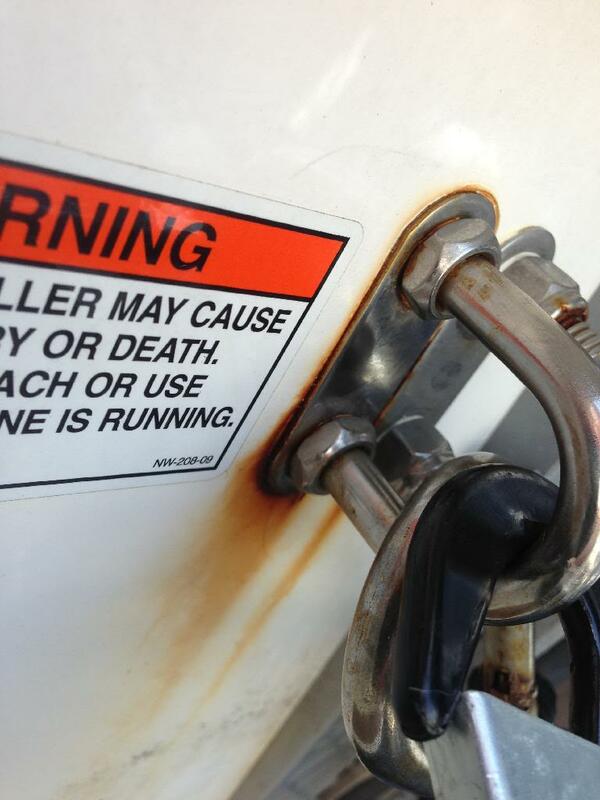 My dinghy, a 12' Novurainia center console has the same rust stains as your AB. I occasionally clean it, but the rust comes back. I would still buy another Novurania though. Thank you for understanding. 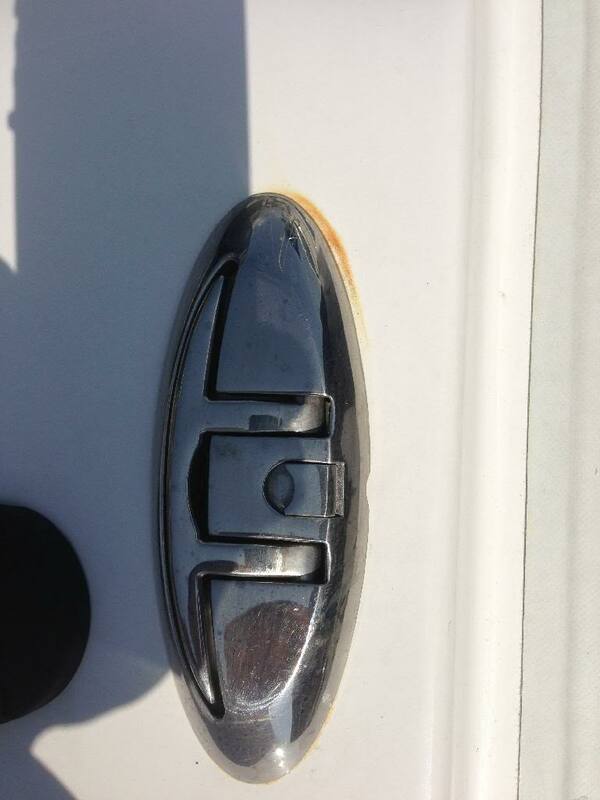 Just an FYI, my dinghy had $22,000 MSRP tag. I wouldn't be so much upset if it was $3500 dinghy. I've thought of bedding as a solution. Dimer2, the dinghy being discussed here is more like 15 to 20k. I thought I'd mention that for others to understand the OP's frustration. Mr. A. I've used 4000UV in past applications for caulking and was pleased with the results. Contrary to Mr. swampu, I would be hesitant to use 5200 in ANY application where there was a chance, however remote, of removing the fitting again. I regularly visit a dinghy dealer in Stuart, FL that has an assortment of new and used boats. Rust on the stainless is pretty typical for the traded units sitting outside, but I have to admit that if that were my new AB, I'd have expected better performance from the SS. Lack of bedding puzzles me..... and at least from what the photos indicate, the places for trapped moisture and salt are where the majority of the problem began, save for the bolt threads and steering wheel spokes which speak for themselves. Holy cow, that's almost as much as my whole boat . I was looking at the AB UL 8.5 at $3580 and thought that reasonable but not cheap. No wonder you are upset.